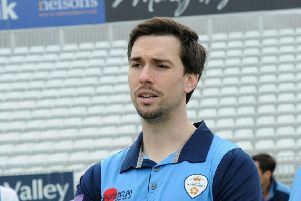 Despite losing their leading wicket-taker and one of the top bowlers in the country over the last two seasons, Derbyshire’s elite performance director Graeme Welch believes they will be stronger as a team this summer. Mark Footitt’s late emergence as a bowler of genuine pace and hostility after several injury-plagued years earned him England recognition and a move to Surrey. On the face of it the task of replacing the left-armer who took the best part of 160 Championship wickets in two years is a tough one but Welch is confident his team are capable of meeting the challenge. Derbyshire’s strength down the years has traditionally been in the seam bowling department and although they have lost Footitt’s ability to swing the ball at speed, Welch believes they will still have a formidable attack. Ahead of this Sunday’s opening county championship match at Bristol, Welch said: “Last year we just chucked the ball to Footy all the time and I think the rest of the bowlers got into a negative mindset that he will get all the wickets and we’ll just bowl dot balls. “So we’ve had a lot of bowler’s meetings about it being a unit. “The young lads like Ben Cotton, Tom Taylor and Shiv Thakor were very inexperienced last year so we’ve challenged them to make more wickets up this time. “We will be looking to rotate because it’s a long season so the bowlers will be fresher and a lot more ready to go when they are called upon. Although new captain and opening batsman Billy Godleman will miss the start of the season after fracturing his left thumb in training on Sunday, the top order looks to have more substance with Neil Broom joining fellow New Zealander Hamish Rutherford at the County Ground. Welch added: “In the last two years we maybe looked a bit inexperienced with people batting two or three places too high but that top order looks like it has a lot of runs in it now. “Wes (Durston) is our front-line spinner this year and will bat at six or seven. “He got 25 wickets last year and we’re covered in a lot more areas.